It is a personal pleasure to welcome all of you, our CNEWA family, to join me on this pastoral visit to southern India. Accompanying me on this journey is Thomas Varghese, who as a vice president in New York oversees CNEWA operations in India. He previously served as the regional director here, so he brings great knowledge and insight on this visit. After a 35-hour trip, we arrived safely in the city of Trivandrum, where we were warmly greeted by our host M.L. Thomas, commonly called ML. Also welcoming us was another member of ML’s staff in Ernakulam, Eby Joy, who will serve as our driver and assistant for the duration of the visit. From the airport, and to my surprise, we traveled “traffic free” to the residence and chancery of the Syro-Malankara Catholic Archeparchy of Trivandrum. The reason we had no traffic was a national strike, not an arrangement made by ML with government authorities as I would have thought it. We were very cordially welcomed by His Beatitude, Baselios Mar Cleemis, major archbishop of the Syro-Malankara Catholic Church, which is one of the Eastern churches in full communion with the Holy Father. Concerned about the rigors of our travels, he immediately invited us to have tea with him and to meet his chancery officials. All were most welcoming to Thomas and myself. Following lunch with Mar Cleemis, we had a wonderful quality visit with him, in which he illumined me about with the missionary thrust of the Syro-Malankara Church. I was particularly moved when he explained how the Syro-Malankara Church reaches out to the dalits — “the untouchables” — and to the Nadar Catholics, “those who have converted to Christianity.” These two groups, as he explained, are basically rejected in society and receive nothing from the government because of their embrace of the Gospel. Mar Cleemis said something that really resonated with me: “In the Syro-Malankara Church, we may never fulfill our own needs, but as we wait to do so, we reach out to help others.” He shared with me the missionary presence of Syro-Malankara priests and sisters working in the Middle East — Saudi Arabia, the Emirates — in Ethiopia and even in my own country. What a wonderful way to initiate our visit, walking in the missionary foot steps of St. Thomas. Following our visit with the major archbishop, we traveled to St. Mary’s Major Seminary, where we were greeted by the rector, Father John Kochuthindil. Father John prepared for our visit by giving the seminarians the day off from classes and exams so they might be more relaxed to enjoy pastoral visit. I was very impressed with this gesture of welcome to this, the seminary responsible for the formation of Syro-Malankara Catholic priests. The highlight and the honor of this visit was to celebrate a Latin Rite Mass in English with the seminary community. Although this is not their traditional liturgical practice, I was taken with their wonderful participation in the liturgy. And part of the honor was also to preach to the seminary community. Following the liturgy, I engaged all seminarians in an exchange in which they could ask questions about me and the work of CNEWA. Father John had introduced me for this segment by giving them a rather complete biography of myself and the many facets of the work done by CNEWA. A prominent feature in his remarks was to thank all of you, friends and benefactors in the CNEWA family. The seminarians, too, expressed their profound gratitude to you and to CNEWA, acknowledging the importance of our sponsorship in their lives. Thomas, ML and I were then invited to join all of the seminarians and staff for dinner. It was very touching to me to see how warmly all of the seminarians relate to each other and to the administration and faculty. I had an opportunity to greet each one of the 149 seminarians and I can share with you that as seminarians everywhere, they were very good eaters. Finishing our seminary visit, we made the trip back to the residence of our host, Baselios Mar Cleemis, where shortly after arrival we were delighted to have our first night of sleep in several days. Before ending the day, I offered a prayer for each of you and thanked God for his kindness and asked that we be kept safe as we trace these missionary footsteps of St. Thomas. After a plentiful breakfast and more wonderful conversation with the major archbishop and his chancery officials, we headed out to the mother house of the Daughters of Mary, one of the larger congregations of women religious in the Trivandrum Syro-Malankara Catholic Church. Waiting at the doorway was our host, Mother Roselin, D.M., the superior of the community. After a coffee with Mother and other council members, she proceeded to give us a mini tour of the facility and to introduce us to a lovely, smiling group of novices, postulants and aspirants — about 50 in total. The joy and happiness of these young girls and sisters was infectious. They greeted us with songs and kind expressions of welcome. And I was invited to share with them about my own life and the work of CNEWA. Our visit with the novices was a special feature in that they were just completing a 40-day retreat in immediate preparation for taking their vows. I kidded them and told them their halos were very bright as they were on retreat for so many days. They made a point of thanking all of you for assisting them in their journey to become religious sisters. They also asked for your prayers as they approach this significant turning point in their lives. It was a delight for me to hug all of the sisters as an expression of your love for them and to receive from them the warm glow of their smiles. In my remarks, I told them that they are part of our family and I was visiting with them to share the love and the support of all of you as I proceeded in this pastoral visit. Mother Roselin took us to the oratory, where she explained that sisters come for seven days of silent prayer as an important form of personal renewal. From the more than 1057 sisters in the community, there were always groups praying in this oratory. Even outside there were some shrines where the sisters could partake in prayer even in the night time. With the power of such prayerful sisters, we are blessed in having them as a part of our family. The sisters made a strong petition to me personally that I would return on a future day, and I assured them I would. Again, they assured me of their prayers in gratitude for all that you do. After another full lunch with the chancery staff, Mar Cleemis gave me a gift as an expression of his thanks for the work of CNEWA. I offered my personal thanks and the thanks from our entire CNEWA family to the major archbishop and for his leadership of the Syro-Malankara Church. We then headed about 45 minutes outside of Trivandrum, through lands filled with coconut plantations to visit the parish mission of St. Mary at Plankeezhu. Located about two miles off the main road, I was very surprised to be greeted warmly by several hundred people who welcomed the major archbishop and me and led us in procession about 200 yards to the actual mission church. The reason for welcoming was to bless the newly renovated chapel. Although there are only 20 families in the parish, the spirit, enthusiasm and faith of the people was very evident. Baselios Mar Cleemis led the people in many prayers and chants, calling upon God’s blessings for this lovely sanctuary. In his remarks to the congregation, he again thanked CNEWA for its continued assistance. On your behalf, I expressed our mutual love for all the people here and assured them of our continued prayers. One image that remained in my mind was the sight of an elderly woman who approached the archbishop for his personal blessing. Prior to receiving his blessing, she pulled from her side a piece of cloth, very neatly folded. Upon opening it, she took 100 rupees and placed it in a donation container on a table. She, as well as all of the participants in the blessing ceremony, were very poor and most of them work as day laborers, performing menial jobs. But in every instance, the same people made a donation to their parish as an expression of their faith. What a beautiful reminder of how our Lord has asked us to give in our need. More than a mile away, we entered the grounds of a very large complex run by the Syro-Malankara Church, which includes a general hospital for the poor, a facility for people with H.I.V. and AIDS, a facility for the treatment of leprosy and a parish church. The highlight of this visit was an entertainment program provided by the children who are H.I.V.-positive. As such, they are outcast in society, in schools and sometimes even in their families. Most of them are either orphans or have been abandoned by their extended families. These wonderfully loving children presented some songs and dances for Baselios Mar Cleemis and me, and for the many parishioners and workers who were also present. Their dancing was superb, but there was one star to be sure: A four-year-old boy who demonstrated an amazing sense of poise by trying to dance along with the older boys and girls. His attempts to imitate them brought warm laughter and applause from everyone. When the program was finished, I hoisted him high in the air so that all might give him a proper acclaim. Arriving during the entertainment program, and visiting with us afterwards, was Bishop Joshua Mar Ignathios of Mavelikara. He has been a regular visitor to the CNEWA office in New York and expressed his thanks to Monsignor Stern and to all of you for your abiding support. He also shared with us the exciting missionary dimension of his eparchy and how many people have been received into the Catholic faith, especially because of the great social works done by the church, as evidenced here at the St. John’s Health Centre. We assured the good bishop of our sustaining support especially in the form of our prayers. After a very long day, and a number of electrical outages, we arrived home and ready for bed. Before retiring, I commend all of you to the Lord and ask that he fill you with his love and peace. This afternoon, Archbishop Raphael Minassian, Armenian ordinary for Eastern Europe, stopped by to visit us at CNEWA. Born in Beirut in 1946, the archbishop was ordained in 1973 and has extensive experience in the media. He was the editor of the magazine Avetaber-Verelk and founded an Armenian television company in 2005. Msgr. John Kozar, president of CNEWA, is beginning a pastoral visit to India “in the footsteps of St. Thomas.” He’ll be filing reports for this blog, along with pictures and video, over the next several days — introducing us to the many sisters, religious and lay people doing some remarkable work in that corner of the world. “St. Thomas definitely landed on this very spot,” says Philomena Pappachan, caretaker of a chapel that marks where the doubting apostle arrived in southern India in the year A.D. 52. Located a few feet from the cemented banks of the Periyar River, the chapel is dwarfed by a grove of palm trees and a 30-foot cutout of the saint, who is depicted with a staff and an open book on which “my Lord and my God” is printed in English. No archaeological evidence exists to substantiate or refute her claim. Yet for nearly two millennia, countless numbers of Christians and Hindus have believed “the holy man” journeyed through Syria, Mesopotamia, Persia and finally India, where Thomas died a martyr’s death in the year 72. Based on oral tradition, the fathers of the church — notably Clement of Alexandria, Ephrem the Syrian, Gregory of Nazianzus, Ambrose of Milan, Jerome and Gregory of Tours — all write of his travels, deeds and faith. In works such as the “Ramban Song,” an ancient lyrical poem, Indians remember Thomas’ miracles and the places where he preached, baptized and founded seven churches. Today, these shrines are major pilgrimage sites for Thomas’ spiritual heirs. Read more in In the Footsteps of St. Thomas from the March 2010 issue of ONE. And be sure to check One-to-One in the days ahead for updates from Msgr. Kozar. Last week, a Vatican diplomat, Archbishop Michael L. Fitzgerald, the Holy See’s delegate to the Arab League, attended an international summit in Tunisia seeking to resolve the crisis. Syria is a cradle of Christianity. The word Christian was first coined in the ancient Syrian city of Antioch — which has been a part of Turkey since the borders were redrawn in 1939. The apostles Peter and Paul settled there, nurturing a church that eventually emerged as the center of Christian thought in the eastern Mediterranean. Antiochene theologians, from both the Greek– and Syriac–speaking communities, played leading roles in the Christological controversies that eventually divided the early church, differences that are now understood as cultural and linguistic. Even as masses of Arab Muslim troops invaded and conquered the Middle East in the seventh century, eventually receiving the majority of its population into Islam, Syrian Christians persevered, living peaceably with their Muslim neighbors. Today, Christians make up about a tenth of Syria’s 22 million people. Half of these two million souls belong to the Orthodox Church of the Patriarchate of Antioch, the preeminent Christian institution in the country. As many as 500,000 people belong to the Syriac Orthodox Church, and another 125,000 belong to the Armenian Apostolic Church. Catholics number around 400,000 people and belong primarily to the Armenian and Melkite Greek Catholic churches. The vast majority of the population of Wadi al Nasarah are Christian, 98 percent of whom belong to the Orthodox Church. The rest attend Melkite or Roman Catholic churches. 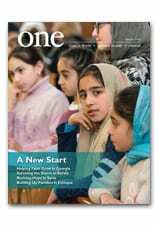 For this and more, read the January 2011 issue of ONE. Romanian photojournalist Andreea Câmpeanu profiled iconographer Sister Eliseea Papacioc for the January issue of ONE magazine. Below, Ms. Câmpeanu shares her experience of meeting Sister Eliseea. I ride a minibus along the bumpy road running from Curtea de Arges, which used to be the capital of Romania in the 14th century, to the small village of Bradetu. Every time we pass a church, all passengers — even young people — make the sign of the cross. This surprises me. In the northern part of the country, where I’m from, I see only old ladies doing it. I’m excited to be making this journey; after countless phone calls, I am finally going to meet iconographer Sister Eliseea Papacioc at her house in the mountains of Romania. Being born in a country where almost everyone is Orthodox Christian by default, as well as being raised in an Orthodox family, I’ve seen icons for most of my life. I have a few in my house, and so do most of my friends. When I was young, I was taught to kiss icons when entering a church, and I did indeed kiss a lot of them. But, like a lot of Romanians, I became indifferent to their beauty. I never really paid attention to their aesthetics. But now, I am going to find out what a true icon is and what it takes to make one. Sister Eliseea Papacioc — thin and tall, dressed in black — is waiting for me in front of the gate, playing with the two big dogs, and trying to hold them back, against their protective instincts at seeing a stranger approach. While talking to her, I realize how much of herself she puts in her work. “There are three types of icons,” she says. “First, there are the kitsch ones, those you buy as souvenir. They are sold by merchandisers or even monasteries.” Those are fine too, she states, because people put them in their car and remember God. “Then you have the nice, well-worked ones, but they often have no life. And in the last category are those icons that are alive, which send a message. Those icons are full of mystery and symbols, icons in front of which you tremble. And those are done with prayer,” Sister Eliseea explains. The atmosphere in her house feels like the one you can sense in a more isolated monastery: that of peace and mystery. I learn from Sister Eliseea that an iconographer has to live a life of constant prayer in order to give to the world the real message of God. Meeting her has given me a great deal of respect for these people who live a life of sacrifice, prayer and belief in order to give back to the world sacred images of the unseen. To see more of Sister Eliseea’s icons, and learn more about her life and work, check out Andreea Câmpeanu’s article A Romanian Renaissance in the January 2012 issue of ONE. For the January 2012 edition of ONE, Peter Lemieux reported on how migrants from Kerala, India have built a church community in Mumbai. Father Francis Eluvathingal, a principal leader in this community, spoke with us about his vocation via Skype. Check it out below. Today is Ash Wednesday, which marks the beginning of the Lenten season. It is a time of preparation for the passion, death and resurrection of Jesus. It is also a time for reflection and sacrifice. What will you be doing this Lenten season? CNEWA actually has a Lenten Giving Plan that may interest you. Check it out on our website. To ensure students can compete in Egypt’s rapidly changing economy, the school’s three-year curriculum focuses on vocational skills consistently in high demand. Most graduates secure employment in their respective trades upon leaving the institute, an accomplishment in which the whole Don Bosco community takes great pride. In line with the charism of their founder, St. John Bosco — the Industrial Revolution-era Italian priest who used education to help impoverished children secure a better life — the Salesians believe education should both enrich the mind of the student and also serve as a steppingstone to a better life. In turn, a higher employment rate contributes to society’s overall economic development and benefits all members of society.